The game here, which I picked up from Deb, is to show us the fifth photo in your fifth photo folder. YOU are tagged! 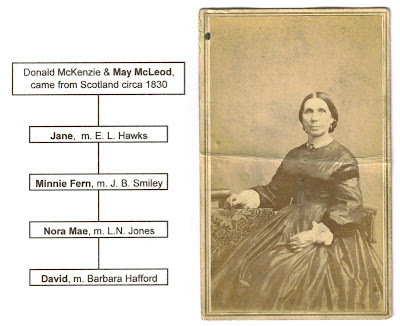 This is my Great-Great-Great Grandmother, May McLeod McKenzie, shown with an abbreviated genealogical chart. (Those are my parents, David and Barbara, listed at the bottom of the chart.) Click if you wish to enlarge. P.S.) I have her Bible. It's in Gaelic. Recently, I had a conservator mend and treat it and make it a special acid-free box. very cool. It looks like your dad had her eyes. Oh my goodness, what a fantastic thing to have!